I've just uploaded manual for my self-published (to be) board game. We are also in the process of creating video tutorials that will supplement learning and finding out all about the game. MAYBE expand the reference sheet with all the various symbols that we can find on cards. 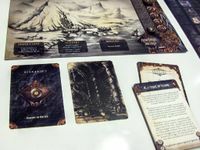 It feels similar to the upcoming Eldritch Horror, yet that one is on the other side of attention scale. Well that's the problem when you are a self-publisher, you need to cover so many angles, not only to produce the best possible product but to promote it incessantly. Thanks to feedback from people like you it somehow all falls into place. 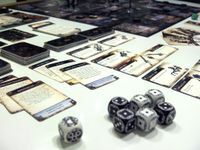 Concerning the rules; many people said that game feels a bit similar to Mansions of Madness, but it is only until they start to play. Machina Arcana uses a grid system with many map tiles, there is no predefined scenario layout so the map grows as the area is explored, differently each time, even with the same scenario. I've tried to implement steampunk concepts into the explorer gear. Items can be upgraded and augmented. For example: you can have a rifle that has a smaller gun upgraded into it, and additionally you can augment a rifle with a scope that gives it additional range. 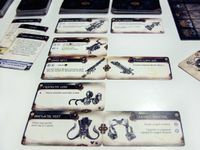 The ruling is very simple and intuitive, you don't even need to read the manual before you can figure out how to connect and use your inventory. Also just a quick glance on the narrative elements. There are so many little stories, events, quests, effects, chapters, background stories and little flavor texts put into this game but I didn't want to make it obtrusive and 'in your face'. 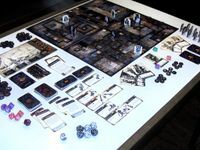 If the players want, they can immerse themselves in the rich setting, but also they can just focus on the rules and play the game like a turn based strategy (and oh yes, there are so many strategies through metagaming). 1. The game is quite hard to win; it is a horror game after all, so don't expect to prance your way through to victory every time you play it. 2. The game is quite easy to play. The main goal was to create a game with massive replay value, almost no setup time and intuitive rules. On our play-testing sessions, after a brief introduction of 8mins a party of 4 could immerse themselves alone, with me providing only subtle and non-invasive support (I've uploaded some images from our convention at Liburnicon, hope they will be available soon).